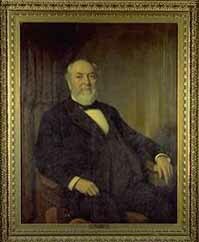 John W. Champlin began his life February 17, 1831, in Kingston, New York. He worked on the family farm in his youth and attended the village schools. He pursued courses in civil engineering for two years and worked in the field for two years in the state of New York. However, in 1854, he decided that he would be more successful in the law profession and moved to Grand Rapids, Michigan, and commenced his study under the direction of his brother, Stephen G. Champlin. By 1855, he was admitted to the Bar and opened a law practice in Grand Rapids. His aptitude with the law was immediately apparent and in 1856, he was asked to draft a revised charter for the city of Grand Rapids. Champlin further engaged in politics when he was elected Judge of the Recorder’s Court in 1861. His service to Grand Rapids continued when he was elected the city’s Mayor for one term in 1867. All the while, he maintained his practice as a lawyer. Champlin’s service to the Michigan Supreme Court began when he defeated Governor Austin Blair for the Court’s vacant seat in 1883. His distinguished service began in 1884.